A man walks past boxes of USAID humanitarian aid at a warehouse at the Tienditas International Bridge on the outskirts of Cucuta, Colombia, Feb. 21, 2019, on the border with Venezuela. Venezuelan President Nicolas Maduro has shut down the country's border with Brazil and threatens to do the same with Colombia to try to stop foreign aid from crossing into the country. A warehouse filled with tons of food, medicine and other aid — primarily from the United States — is sitting in warehouses on the Colombian side of a bridge to Venezuela. Maduro says Venezuela is not a nation of "beggars" and vows to refuse the aid, which he considers the vanguard of a U.S. invasion. Maduro has sent Venezuelan soldiers to various border crossings. Opposition leader and self-proclaimed interim President Juan Guaido has vowed to get the aid through on Saturday, despite the threat of military force. It is unclear how he plans to do that. But Guaido and his supporters have mobilized thousands of volunteers — including doctors, nurses and ordinary citizens — to help. 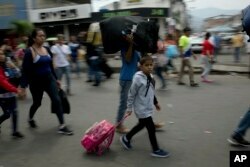 Venezuelans leave their country as they make their way to the Simon Bolivar international bridge in San Antonio del Tachira, Venezuela, on the border with Colombia, Feb. 21, 2019. Meanwhile, a group of Venezuelan lawmakers clashed with soldiers outside Caracas as they tried to drive a truck through a highway roadblock on their way to the Colombian border. The soldiers fired tear gas when some of the lawmakers got out and tried to move the barriers. They demanded to know why the soldiers "support this insolence while the people die of hunger." "Pretending that humanitarian aid is not going to reach the people of Venezuela is an act of cruelty," said Delsa Solorzano, deputy head of the National Assembly. "We know that these soldiers are passing the same need as all the people of Venezuela." As head of the opposition-led National Assembly, Guaido invoked the constitution to declare himself interim president after saying Maduro's re-election last year was a sham. The United States was the first to recognize Guaido as Venezuelan president, followed by about 50 other nations. Maduro has offered to meet with Guaido, but is refusing to step down or call for early elections. The collapse in global energy prices, corruption and failed socialist policies have left oil-rich Venezuela's economy in shambles. More than 3 million people have fled the country and its severe shortages of food, fuel and basic goods.